Dainty, delicate 15mm hand stamped pendants with an edge! A cute silver-plated pewter raised-edged pendant (or you can upgrade to sterling silver raised-edge pendant if you wish) encases a brilliant shiny gold-fill middle. 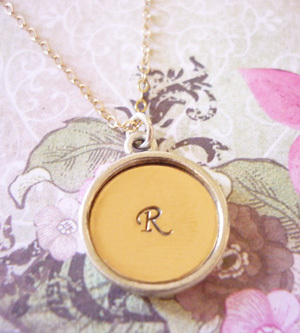 The initial of your loved one is stamped in the centre and your choice of gold or silver chain is added for a simple yet extremely classy necklace! Gold-fill is an economical alternative to pure gold that is a solid layer of 14 karat gold permanently bonded to an internal metal. It is NOT the same as the lesser quality gold plate. Under normal wear and with the reasonable care that you would give any precious metal jewellery, 14kt gold-filled will not peel, flake, or wear off. It's tarnish-resistant like solid 14 karat gold and is safe for most people with sensitive skin.